Our experienced, USA-based team of customer agents is trained to help cut through red tape and get documents faster and with less hassle. Expressvitals.com is a privately owned website that is not owned or operated by any government agency. What do we do here at Express Vitals? It's simple. We take an incredibly tedious, confusing, drawn-out process, and do it for you. No more waiting around state or county offices, no more trying to figure out government forms, and no more waiting for weeks. Because our US-based processing team does this every day, they know how to get your documents fast and with the least amount of hassle so you can get back to your life. You can read more about who we are and what makes us different from the competition here. No extra support, online or on the phone. Totally self-serviced. No extra online security. Each state site may or may not be secure. Regular government processing from state and local agencies. Real-live, experienced processors who cut through red tape. State-of-the art online security to protect your data. Expedited process with optional overnight shipping. Can We Process In Your State? Awesome job! Thanks guys for everything! I would recommend you highly. Thank you so much for the service. I received the birth certificates yesterday. GREAT service! I just received my son's birth certificate. That was amazingly quick!!!! Thank you so much! I really appreciate your help. We'd really appreciate your business! 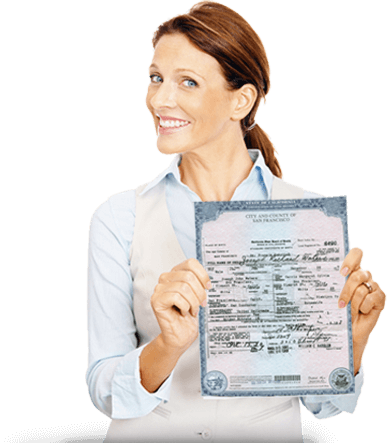 We are here to make sure you receive your birth certificate with as little hassle and as quickly as possible. Please take advantage of our offer to take $10 off your order if you complete your order with us now.